Test Data is data that is used to execute the tests on testware. Test data needs to be precise and exhaustive to uncover the defects in developed or under-construction software. Thus any information that is used as an input to perform a test is Test Data. Test Data Management (TDM) is also known as Software Test Data Management. It is the process of planning, designing, storing and managing software quality-testing processes and methodologies. The primary purpose of Test Data Management is to create, manage and maintain the source codes of an application or software for testing purposes. Key TDM services include Data Masking (obfuscating) of sensitive information and synthetic data creation. Intelligent routing, optimization and protection of data for storage or data movement in a computer system is termed as “Data conditioning”. One of the key purposes of test data management is to minimize and optimize the size of software testing data, as well as to gather and centralize software testing documentation and resources. Test Data management is very critical during the test life cycle. The amount of data that is generated is enormous for testing the application. It greatly contributes to the efficiency of a product. Finds out the appropriate test data from these data for the testing process. Extracts the subset of data from the selected test data. Uses masking for sensitive test data. Performs accuracy test by comparison between the actual data and baseline test data of the application. Refreshes the test data to increase the efficiency of the application. also known as Application Testing, investigates, evaluates and ascertains the perfection of computer software. It ensures the compliance of a software product for regulatory, business, technical, functional and user requirements. Checks its completeness in terms of core requirements. Involves examining and checking software. Verifies software’s perfection for functional and business requirements. Assesses usability, performance, security, compatibility and installation. is a set of steps used to test software products that helps in making this process more sophisticated, consistent and effective. It begins with an analysis of testing requirements or figuring out the targets of the testing. All possible scenarios are considered where a lack of testing could lead to software vulnerabilities. Retesting is carried out for some troubling elements. “Closure” step, ensures the completion of everything. is also known as Testing Software, Test Automation Software, a Test Automation Tool or an Automated Testing Tool. It is a type of software that provides automated evaluation, testing and quality assurance of software. It is used in software testing processes by automating routine and rigorous software testing techniques, processes and workflows. 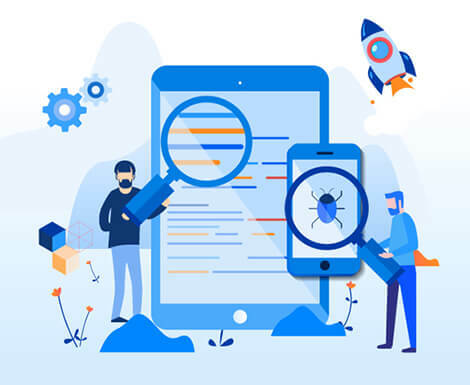 Automated Testing Software reviews the code, structure and context of the software being tested, such as regression testing. It seeks out and identifies any bugs, errors and/or other programming defects within the source code. is a bunch of computing-based processes, techniques and tools that test software applications or programs. It is performed through using a combination of software- and hardware-based tools and techniques. CAST is primarily designed to automate the process of software testing and provide services that can’t be accomplished by human or manual testing or consume too much time and resources when done this way. It is generally performed through purpose-built software testing solutions that are designed to provide one or more software testing processes/techniques. BrandCrock GmbH, Munich is very much in this business of Test Data Management. The work done by our team reduces the time for provision of any type of Test Data. It includes masked or unmasked production data, subsets, and synthetic data set, enabling organizations to collapse cycle times. Our expertise in Test Data Management reduces wait-time for environments and speeds up application releases with fast and secure data distribution. BrandCrock GmbH puts sufficient levels of automation in place to enable QA teams to access their data via self service. QA engineers can easily bookmark and reset their data to any previous state. BrandCrock GmbH enables QA teams to maintain libraries of test data leading to higher release quality. Bookmarks of environments containing errors can be instantly shared with our developers for further improvement and collaboration that will reduce the time to resolve defects. Contact or call us. We suggest our patrons to access the right test data at the right time.